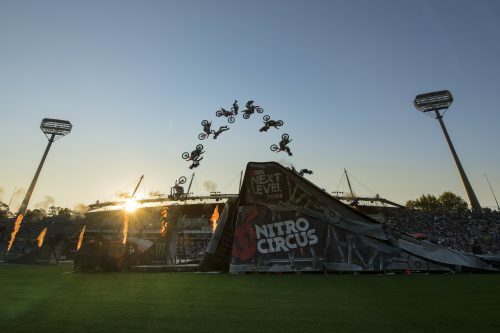 Nitro Circus, the global youth entertainment phenomenon, returns to North America this year with the epic Next Level Tour. This spectacular brand new production, the ultimate full-moto show ever seen, will have death-defying tricks, jaw-dropping world firsts, and absurd stunts. It all adds up to a thrilling show simply too big to fit indoors. The Next Level Tour launches in mid-May, just in time for summer, and will visit over 10 cities across the continent through June. Tickets can be purchased at nitrocircus.live. For an advance look at the Next Level Tour go here. Brainchild of Travis Pastrana – global superstar, action sports icon and Nitro Circus ringleader – the Next Level Tour features the best athletes in action sports taking on the biggest ramps in the world. 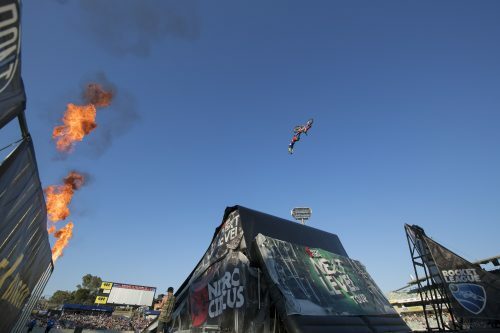 The Nitro Circus design team has put it all on the line with this show doubling down on the risk factor. The FMX Next Level takeoff ramp alone, towering 15-feet above the show floor (five feet taller than anything toured before) launches riders more than 60-feet into the sky. The lander also looms large, standing 23-feet high. This innovative setup, the result of years of research and development, was first dreamed up at Travis’ “Pastranaland” compound and then perfected at Nitro World Games. These breakthrough designs were never supposed to tour, as they were considered far too large and complex to be set up more than once. 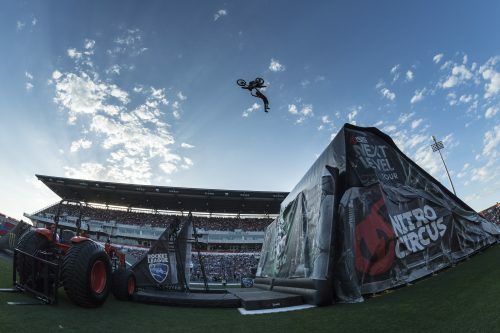 But Nitro Circus was determined to showcase them, and the future of action sports, to its diehard fans around the world. Now, after months of hard work, these ramps are hitting the road. 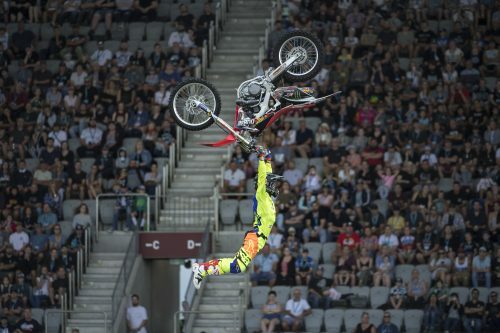 Progression is truly in this monster’s DNA: the FMX Next Level ramps feature elements from the jaw-dropping setup used by Josh Sheehan in 2015 to stomp the previously unthinkable triple backflip on a motorbike as well as the extremely sketchy FMX frontflip ramp used at Nitro World Games. It was off this same ramp that Gregg Duffy made global headlines in 2016 when he landed the world’s first double frontflip while last summer Harry Bink scored a huge world’s first of his own: the frontflip rock solid. As if they needed more motivation, every night Nitro’s athletes will battle in a full-throttle Next Level Series FMX competition. For the first time, Nitro Circus will host an in-show competition to find out just who is the gnarliest rider on the planet. At each tour stop a panel of judges will determine a winner with the overall champion crowned at the end of the tour. While cash prizes are on the line, bragging rights are truly the top prize for this crew. 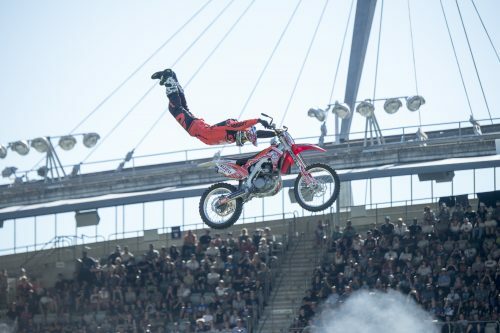 In addition to pushing FMX to its limits, one Nitro Circus’ daredevil will go airborne on a 450-pound snowmobile while a new cast of hilarious characters will take stupid to an entirely different level, flipping motorized contraptions too ridiculous to be believed. Sponsors for Nitro Circus: the Next Level Tour include Kevlar, Yokohama, Parts Canada, Brimstone, Grunt Style, Vivid Seats and EDGEtv.